Commissioning an artist to paint a portrait can be both an exciting and daunting experience. It can be the perfect way to convey how you feel about a loved one and should, if completed well, convey a presence that photographs struggle to convey. Portrait paintings can range from timeless reflections and celebrations of how we feel to corporate portraits which are less sentimental and can emphasize power, authority and stature. 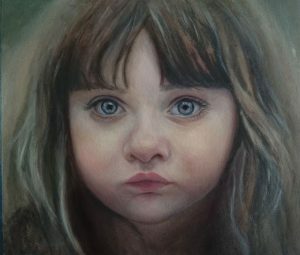 Clients can often feel prohibited from commissioning a portrait because they feel that the total costs may be too high, but this needn’t be the case. Prices can vary depending on expectations, size and medium. Highly detailed, large portrait paintings can be costly due to the time and materials used. However, it is possible to create beautiful paintings that are smaller and more intimate and within a clients budget. 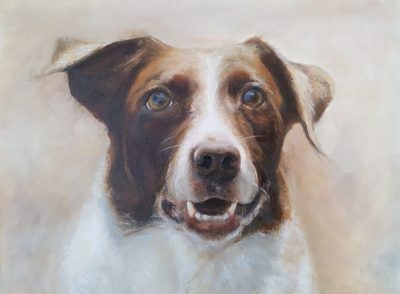 As well as portraits of people, I also paint dog portraits. I offer a commission service in oil paints creating beautiful paintings for you to treasure. If you want to discuss options and your budget get in touch through my contact us page, which you’ll find above in the main site navigation.